What happens to your story once you hit the send button? This blog post will explain a little bit about the Rate Your Story process. If you've submitted before, you probably know most of this. But if you're new, this post will be helpful in understanding what type of critique you'll get for free at Rate Your Story. 1. You hit "send" and, as long as you've strictly submitted your manuscript according to our submission guidelines (and we're open to submissions), it goes in our inbox. 3. Then, it may sit in our inbox for a few days. Miranda Paul, site administrator, logs in every few days and disperses "batches" of manuscripts to various judges. 4. After a week or so (sometimes more, sometimes less) of reading and rereading your manuscript, our volunteer judges consult the Rating Scale and give the manuscript a number between 1-10. Many also write up helpful comments, and email their scores back to Miranda. 8. Once manuscripts are all caught up to a certain date, Rate Your Story will tweet the update using our Twitter name @RateYourStory and the hashtag #RateYS. Last, but not least: If you think your manuscript has been lost in eSpace, contact us after 14 days. We're not perfect, so occasionally it takes us longer. But you should check anyway because sometimes we find that an email has been completely overlooked for one reason or another. We're happy to help you become published writers! 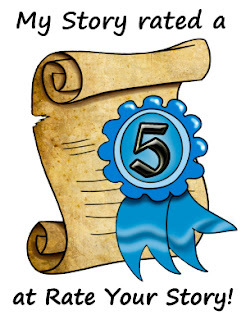 Please consider becoming a volunteer judge today, and help us re-open submissions faster! We love book releases, and this Wednesday marks an extra special one. TOUCH OF DEATH, a chilling new YA novel published by Spencer Hill Press, was written by one of our own Rate Your Story judges: Kelly Hashway. And she's taken time out of her (very) busy schedule this week to pop by and answer a few questions about her path to publication (and she read a few submissions, too!). Kelly Hashway is the author of the Touch of Death series (Spencer Hill Press) and the Game. Set. Match. Heartbreak series (Swoon Romance). In addition to writing young adult novels, she also writes middle grade and picture books. She's represented by Lauren Hammond of ADA Management. Miranda: Good morning, Kelly! So glad to have you. And I'm so excited for your book, since we've been in contact long before you even finished this one and began submitting it. I also know you began your publishing career with short stories for magazines and picture books, and I've heard that a lot of beginners start this way, rather than jumping into a novel (I know I took that path as well). Do you think learning the revision process on these shorter forms helped you become a novelist? Kelly: I tried to write a novel before I began writing short stories and picture books, but I found that going back and starting smaller was a better plan for me. Working with shorter word counts made the task of revision more manageable and it taught me a lot about using specific verbs and the importance of word choice. That's something that I was able to carry over into my novel writing. Miranda: Interesting. That makes me wonder...What does your office/workspace look like? Kelly: I write at my dining room table. I dream of having an office one day, but for now, I'm content with my laptop, container of flash drives, notebooks, pens, and my day planner. Miranda: Impressive! If you had to estimate, revision is what percentage of the writing process? Kelly: 85-90% I draft quickly and then spend a lot of time revising. After the books are acquired, I go through multiple rounds of edits, where I revise further. Most of my time is spent in revisions. Miranda: I know that many of our readers are searching for an agent, and last week we featured one RYS submitter who recently landed an agent. How did you land your agent? Can you shed some light on the process? Does your agent love everything you write? Kelly: I queried agents off and on for 13 months before I signed with my agent. I queried too soon, before the query and manuscript were ready, so I hit pause and revised. Then I entered some query contests and learned more about how to craft a query that works. I spent about five months getting requests for fulls and waiting to hear. It's a lengthy process, but when I got "the call" it was all worth it. I actually pitch my ideas to my agent so I can judge her reaction before I dive in. She's great with letting me know what will work and what is going to need to be reworked. Miranda:What was the harshest critique you've ever gotten on your work? Did you end up changing your manuscript to make it better because of that critique? Kelly: Hmm, honestly it was probably from a reader and not a critique partner, so no, I didn't go back and change the book. Not everyone will love your work. It's just a fact of the industry. I write the best story I can and hope for the best. However, when it comes to my critique group, if I get the same comments from a few of my CPs, then I definitely revisit the manuscript. Miranda: Do you attend conferences and workshops? Which ones, if so? If not, why not? Kelly: Yes! Conferences are wonderful. I've attended The Pocono Retreat for the past three years. It's my local SCBWI writers' retreat, and I always learn a lot. I also attend online conferences because those are cheaper and some are even free. I love WriteOnCon, which takes place in August each year. Kelly: The Green Bay Packers! Miranda: Good answer :) Let's hope for a better postseason next year, then! Thanks everyone for stopping by. And don't forget to check out TOUCH OF DEATH and Kelly's soon-to-be-released YA novella later this month. You can also learn more about Kelly and her books at http://kellyhashway.blogspot.com. 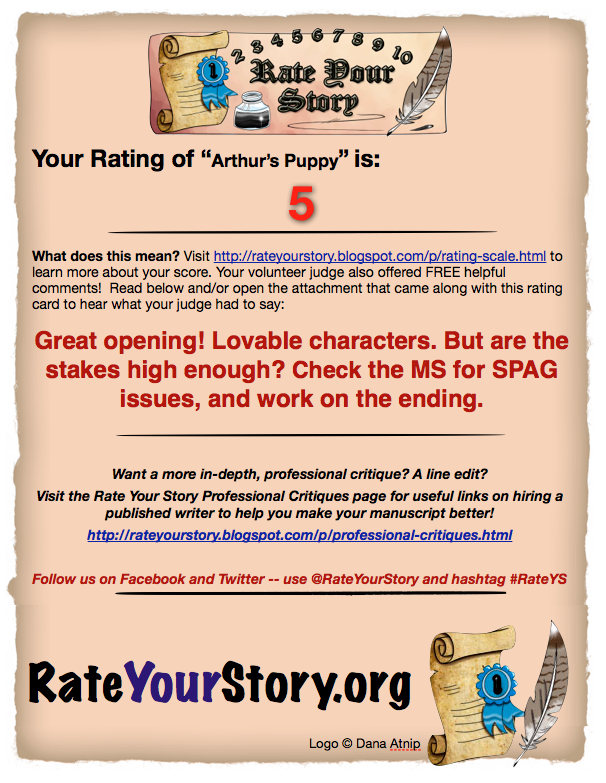 At Rate Your Story, we LOVE hearing good news about the progress of your manuscripts. Though we know that you all are behind the bulk of the work, and the kudos goes to you, we are excited to know that we helped a teensy bit in your journeys toward being published. So, we were of course excited to hear that one of our regular submitters, Dev Petty, has accomplished the feat of snagging an agent! Since Dev writes mostly picture books, too (a tough market at the current time), we were estatic to hear that RYS played a little role in helping her get her manuscripts up to shape. Of course, all of the credit goes to her. Without further ado, I'd like to share a short interview with Dev, which may shed light on the process of attaining an agent for those of you who are looking to do so! Miranda: Hi Dev! Thanks for coming. So, I want to know your story from the beginning. When did you begin writing? What do you write? Dev: I began writing just a couple of years ago. A mom-friend of mine was taking a personal essay class and recommended it. It was a workshop where you wrote a new piece each week and I really enjoyed the process...and, I might add, personal essay is about the cheapest therapy available. The teacher was involved in children's publishing and she sort of piqued my interest in writing for kids. That led to me to write my first picture book and I was pretty much hooked. Miranda: How did you come across Rate Your Story? Had you already been submitting manuscripts to agents or publishers before using the RYS service? 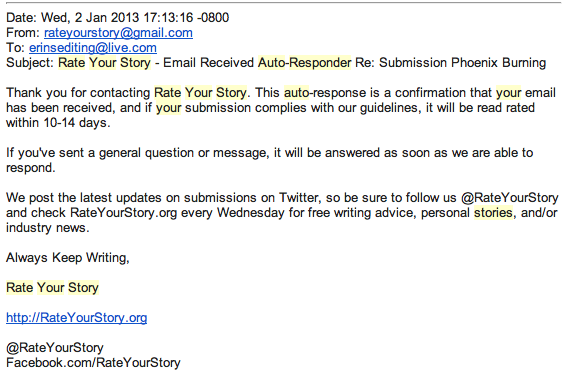 Some of the members of my critique group were using Rate Your Story and that's how I learned about it. In fact, I didn't even know what they meant when they'd send out a mail which said, "I got a 2!" or "Rats, I got a 6." But I quickly learned and started sending things in. Miranda: Do you think the RYS feedback played a role in revising your manuscript so that it would be noticed by an agent? I do. I sent many stories to RYS and I received some useful feedback. It was generally positive feedback and that told me I wasn't crazy, especially as my work can be pretty quirky. I wanted to be edgy but not so far as to be unapproachable or unreadable so it was great to get feedback that my stories were indeed funny and were being received as I'd intended. They could easily have written back “What the--? ?” but they didn't, so I had a reasonable sense that others might get it too. Miranda: How many agents did you submit to? How did you decide which manuscript to send? Which agents to send to? I came up with a list of 12 agents to submit to in general though I had a few I focused on. I picked the twelve agents based on a few criteria. First, and this sounds crazy, but they all accepted electronic submissions. I'm a mom of two young daughters so putting something in an envelope and getting it in the mail might as well be brain surgery. I also looked at their catalogs to make sure they did picture books and did them willingly and happily, not the "once in a great, great while when it's windy and the moon is a crescent, we may possibly consider one picture book a decade." Some were names I'd gathered in interviews who had a interest in my style of work, or from conferences. As for the choice of manuscript, as I've found my voice in picture book writing, which is a little offbeat, what is a good story (for me) and what is not has become much clearer. So when I had something good, I knew it, even though it's a story they ended up passing on. Miranda: Did your agent sign you right away or did she want to see more manuscripts first? I had actually submitted a few manuscripts to my agent before and we had a nice relationship going, though no deal. So they were tops on my list, mostly because they usually replied personally and seemed to have an interest in my work, even if I was missing the mark. When I had something worth sending, I sent it straight to them and they liked it. They did ask for three more stories to get a sense of me as a writer and of my style. And that's sort of a funny bit too, because I sent three stories which I had barely shown to anyone and revised very little. They were straight from the gut, the product of some coffee induced clairvoyance over the summer when I had a bit of extra time with my kids in camp. FCL had rejected some of my stories and a few just weren't that interesting, but then there were these three which I secretly really loved...so I sent those. And they liked em. Miranda: What's it like to have an agent so far? Getting an agent, and in some ways, this agent, occupied much of my efforts and now I'm a little at loose ends. I let myself veg out for a while and now I've been writing again and coming up with some work I'm really happy with. It's nice to have a partner and to have someone who really likes my writing, which can be a little unusual. My agent knows the editors and understands the business at a much more sophisticated level than I, so I feel I'm getting the best possible chance at being published by working with them. I also feel like they really understand me as a writer and want me to be myself, which is pretty cool...if only because when I try to write sweet, warm, fuzzy stories it comes out just awful. Miranda: What is one thing you wish your writing fairy would have told you earlier on in the process? Trust your gut. While critique groups are essential and conferences are useful, ultimately the stories they liked were the most "me" of all I've written. They broke some rules and mostly they just cracked me up. If I'd thrown them in the slush pile because they were too weird, this wouldn't have happened. One person in the biz who read one of my three stories said, "This isn't even a story." I kind of like that now. Miranda: What advice do you have for authors who are seeking agent representation? Sounds trite, but I'd say to stick with it. It takes time and persistence. Also, because it's so much about right story, right agent, right time, you really must be willing to submit your work. If you've gotten generally good feedback from a wide swath of people, worked hard, made changes which you believe in and not those you don't, then you should submit. You can only sit on a story for so long before you need to begin the whole arc, even if that arc leads to a stack of rejections. Miranda: What is one thing authors seeking agent representation should NOT do? I would say not to ignore the oft-offered advice to make sure your agency is a good fit for your story. I know it can be hard to tell, but if you look at an agency's catalog and it's all night time teddybear stories, you know, kittens with balls of yarn and lessons learned, you should probably not send them some spartan, edgy, Jon Klassen type of manuscript. It's also really about relationships. Go to a conference and see just how many people are there. There are so many people who think writing a picture book is easy because it's short and it's for kids. But kids are discriminating and publishers even more. You need to be pretty serious about it and about building relationships, going to conferences, following through etc. If you go to a conference and there's a nice agent person, go say hello and then talk to them. I know this is hard, believe me, I can be the most awkward lady in the room, but I'm learning. Then you go home and you send them an email or something and voila! a relationship, or at least a seed of one. Ack! Seriously, that's super hard. Ok, let me think. Picture books, I'd pick Dr. Seuss as the author and Shaun Tan's, The Lost Thing, for a book. For longer books, I'd say "The Book Thief" by Marcus Zusak, which may be one of the very best books I've ever read. For an author, maybe Jonathon Lethem, or Carl Hiassen, or Steinbeck, or Suzanne Collins...seriously, this is hard! Miranda: How important do you think it is to know about the publishing business and pay attention to trends in publishing? If you were trying to get any job, you would do some research first, so knowing what's going on and what's popular is wise. You don't want to be derivative, but you can also be really inspired by what's out there. I visit bookstores quite a bit and pay close attention to what's current and outward facing in the picture book department. What's on the shelf now has nothing to do with what will be published later, but still, I think you can get a real sense of things. When you read book after book, you get a feel for flow and character. You develop an ear for it and once you have a sense of the rules and the conventions you can start breaking the rules and conventions. Miranda: Thank you, Dev! And to all readers, comments are open if you'd like to send a comment or question to Dev. I appreciate her willingness to share her story! We all hope that 2012 was a successful writing year for all of you, and wish you the best in 2013. 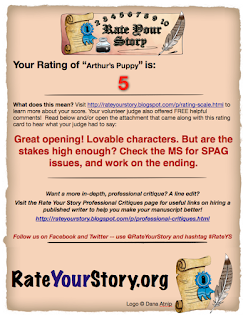 To help out, Rate Your Story is now open to submissions for free critique ratings! We will also continue our Writing Wednesday Series with articles and personal stories on the craft and business of writing and publishing. Up next week is an RYS submitter who has now landed an agent, and says RYS played a role in that journey. Don't forget to check back on Wednesday, January 9th!